It’s a new year for MBA admissions and there are updated Haas essays! And a new opportunity to share how your path has shaped you. While it may appear that Haas has reduced its word count, the addition of a new type of optional essay gives you an opportunity to tell a different part of your story. As always, it will be important to demonstrate how you embrace the four defining principles of Haas: Question the Status Quo, Confidence without Attitude, Student Always and Beyond Yourself. Through these principles, Haas is making culture a differentiator. The culture of Haas is extremely important and valued – in your essays, make sure you show how you will continue and enrich Haas culture. The addition of a new type of Optional Essay shows Haas’s commitment to understand your path and articulate how the events of your life have impacted you. While some schools ask some of these questions as a part of the application, Haas is taking it to a new level with 300 words to be able to explain the story. As one of the smaller business schools, with ~260 students per class, Haas wants to know how you fit within this very close-knit, collaborative and student-driven culture. Be authentic and write about who you are and not who you think Haas wants you to be. Find a comfortable spot with the beverage of your choice and think about why you want an MBA? Why now? And Why Haas? Use the essays to help paint your unique answer to these questions. Tell us a story that defines who you are? With 50 more words this year, you can go a bit deeper with your story. Don’t start with the title – first find the right story. Perhaps there is a moment of which you are proud, a failure that taught you something important or a story that provides insight into your personality or what drives you. While the title can be fun and catching to draw the reader in – what’s most important is your story. How does this story show that you would be a good fit to Haas – and highlight one of the principles. After you’ve written your story, have someone who knows you well read it – and make sure they are seeing the same themes that you want to show. What are you going to do? Why do you want to do it? How will it benefit others? This year, Haas has decided to look to the future rather than focus on your experiences of the past. Behind this question is the belief that people who are working toward their passion will do great things. What is meaningful to you? And the key here is YOU! Start by articulating what you want to do post-Haas. Be clear and concise so all who read it will understand your goal. Try your answer out on a few colleagues or friends and ask them if the goal makes sense for you. Next, talk about how this first step will set you up for success in your future career and how you see yourself making an impact with that career. 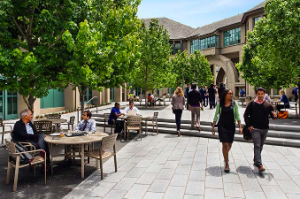 Berkeley-Haas focuses on developing innovative and responsible leaders who find new ways to solve problems. What do you want to innovate? And how will it benefit the world? What skills have you innately developed through these experiences that have helped you succeed to where you are today? This new optional essay is showing Haas’s commitment to diversity across all levels. They want to know about what experiences have shaped your path – and truly value the skills these experiences have taught you. Some call it grit. As with other parts of the application, be honest and genuine. In your elaboration, focus on how any of these experiences have shaped your life, goals and future plans. The post How to Write the New Haas MBA Essays by Melisa Prevost appeared first on Stratus.